Scientific Name: Triticum aestivum, T. durum and other Triticum species. Occurrence: Wheat is found in breads, biscuits, cakes, pancakes, pasta, pastry and breakfast cereals. It is also in some beers. More information.. Wheat is a plant belonging to the family of the grasses (Poaceae) and is cultivated globally being one of the most important cereal crops world-wide. Wheat belongs to the genus Triticum. There are different species of wheat; the most widely cultivated are common wheat (T. aestivum) and so-called durum (T. durum), the former accounts for approximately 95% of world production and the latter for approximately 5%. Wheat provides over 20% of the calories for the world population and in 1997/98 world wheat production totalled 579 million tons; in 2000 it was approximately 571 million tons; about 35% of the world’s wheat is produced in Asia, 17% in Europe and 16% in the United States. It is estimated that nearly two-thirds of the wheat is used for human nutrition and a little less than one-third is used livestock feed and non-food applications. The majority of the wheat produced is consumed in the country in which it is grown. The wheat kernel is the seed of the wheat plant. Each tiny seed has three parts: the endosperm, the bran, and the germ. The endosperm is the largest part of the kernel and is where the starch is stored and where the largest amount of flour comes from. It also contains protein, iron, and B-complex vitamins. The wheat bran is the outer coat of the kernel and contains mostly fibre, but also contains protein and B-complex vitamin. It is only present in whole-wheat flour. Adverse reactions to wheat may be explained by different mechanisms. The most common hypersensitivity to wheat is caused by the gluten-fraction of wheat and some other cereals. Gliadins in gluten play an important role. This hypersensitivity is called celiac disease and is characterized by chronic diarrhoea, abdominal bloating, pain, weight loss, iron deficiency and evidence of nutrient malabsorption. At this place, however, we only deal with the less common form of hypersensitivity to wheat, i.e. IgE-mediated or type I wheat allergy. Immunoglobulin E (IgE) is the allergy antibody. Wheat proteins of the kernel are responsible for IgE-mediated food allergic reactions. Several proteins have been identified as allergens amongst which is also gliadin, albumins and globulins but very little is known about their relevance. Some wheat allergens are the same proteins as allergens in grass pollen. Their relevance as food allergens is unlikely. Wheat allergy often leads to symptoms of the skin (atopic dermatitis or eczema and urticaria or nettle rash). It can also cause swelling of skin, lips or throat (angioedema), symptoms of the stomach/gut (diarrhoea, nausea, abdominal pain and vomiting), runny or stuffed nose and asthma, and in severe cases anaphylactic shock. Exercise-induced wheat allergy (WDEIA) occurs within minutes to hours after ingestion of wheat. The duration of exercise needed to spark off a reaction is between 10 and 60 minutes. The symptoms typically range from nettle rash (urticaria) and swelling of the skin (angioedema) to shortness of breath (dyspnea), drop in blood pressure, collapse and shock. Occupational allergy to wheat flour in bakers is usually limited to asthma. Wheat is related to other cereal grains like barley, rye, corn (maize) and rice. Very little is known about the risk that these related cereals cause allergy in patients with wheat allergy. Corn and rice are usually well-tolerated by wheat-allergic patients. Barley, however, has been reported to cause symptoms. Similar proteins are present in all cereals. Theoretically wheat allergic patients might react to several of these related proteins. Such reactions based on similarity are called cross-reactions. For cereals this problem of multiple sensitivities appears to be of limited importance. Although wheat is generally mentioned together with milk, egg, shrimp, fish, peanut, soy, and tree nuts as common cause of food allergy, data supporting this are missing. In children, wheat allergy is possibly more frequent than in adults but the prevalence is certainly much lower than to those other foods. A recent study among young adults in Australia resulted in a prevalence of about 0.25%. Among 486 Danish families, 1834 subjects were investigated for food allergy. These included 486 3 year old children, 111 < 3 year, 301 older than 3 year and 936 adults. In none of these subjects, wheat allergy could be confirmed. There are no data available on the prognosis (persistence or outgrowth) of wheat allergy. A specific type of wheat-related allergy is linked to physical exercise after wheat consumption, so-called wheat-dependent, exercise-induced anaphylaxis (WDEIA). This type of wheat allergy is mainly reported for adults without a history of wheat allergy in childhood. Overestimation of the importance of wheat as a source of food allergy is possibly related to confusion with celiac disease. Additionally, wheat is also an important source of allergy amongst bakers. Although bakers usually suffer from asthma induced by breathing flour dust, the perception of wheat as an important allergenic food might partially arise from this phenomenon. For wheat it has not been accurately established how little wheat causes a reaction. For some foods like milk, egg and peanut these levels have been established to be in the milligram range, i.e. 1/1000 of a gram, for very sensitive patients. For wheat such data are not yet available. A challenge protocol recently reported by a group of German paediatricians used a range between 4 mg and 3.5 gram of wheat flour. Although it was not communicated at which quantities positive reactions were observed, it clearly indicates that low quantities of wheat flour, i.e. in the milligram to gram range are enough to induce symptoms. Diagnosis of wheat allergy starts with recording a clear clinical history to establish a link between allergic reactions and wheat. This will also distinguish IgE-mediated allergy from celiac disease. Skin prick tests and measurement of specific IgE levels are used to support a history-based suspicion of IgE-mediated wheat allergy. Wheat shares similar allergens with other cereals but notably also with grass pollen. A positive skin test or serum IgE test for wheat can easily be based on cross-reactivity to grass pollen. Positive test results based on similarity between allergens from grass pollen and cereal proteins is a frequent cause of false-positive diagnoses. To distinguish whether cross reactions have clinical relevance, the only definitive method is a so-called double-blind placebo-controlled food challenge. In this procedure, increasing doses of wheat are administered to the patient as well as placebo meals not containing wheat. Both patient and doctor are unaware of the meals with and without wheat. Effective blinding of the taste of wheat is essential for such challenge procedures. Where do I find wheat? Common wheat is used for preparing soft wheat flour products such as bread, biscuits, crackers, cookies, cakes, pastry, thickening agents, and breakfast cereals; it is also used for the production of alcoholic beverages such as beer and whiskey, and for industrial alcohol; bran from flour milling is used for livestock feed. Durum wheat is used principally for the production of pasta. Italian legislation does not allow the use of other wheat species for the making of pasta. Wheat is also present in products where it is less obvious like battered foods, bouillon cubes and soups, corn starch, breaded meats and vegetables, coffee substitutes, surimi, couscous, gravy, hot dogs, ice cream, processed meats, milk shakes, seasonings and spices like pepper, liquorice, chewing gum, candies, chocolate bars, salad dressings, soy sauce, ketchup, mustard and other sauces. Hair cosmetic and hygiene products as well as pharmaceutical products like medications and vitamins may contain wheat. In some cases corn starch is an ingredient which in its turn contains wheat. Pet foods can also contain wheat. For the treatment of food allergy, at present avoidance is the only solution. Since wheat is used in many common food products also as an “invisible” ingredient, avoidance is difficult. Indications on food labels that point towards (possible) use of wheat as an ingredient include bulgur, bran, couscous, farina, gluten, kamut, MSG (monosodium glutamate), protein, semolina, and spelt. Fortunately, according to recent new legislation (EU Labelling Directive 2003/89/EG and list of Codex Alimentarius Commission on mandatory labelling of pre-packaged food) all products containing wheat-derived ingredients should be labelled as such. This database contains information on IgE mediated allergy (type 1 hypersensitivity) rather than on coeliac disease. See the allergy portal http://www.foodallergens.info/portal.html for some links on coeliac disease. 27 patients reported symptoms including included asthma, angioedema, atopic dermatitis, cough, erythema, abdominal colic, headache, larynx oedema, oral allergy syndrome, pruritus, rhinitis, urticaria and nausea and vomiting. However, only 13/27 were DBPCFC positive. Patients reporting only pruritus were negative on challenge (Scibilia et al. 2006) . 1 patient was reported by Herzinger et al. (2004)  with initially angioedema and urticaria after drinking wheat beer. A month later beer caused generalized pruritus, urticaria and a short peroid of unconsiousness. The patient could tolerate beers made only with barley (and also bread). 14 children and 14 adults were reported by Battais et al. (2003)  to have symptoms including atopic dermatitis, asthma, urticaria, eczema, digestive symptoms and one case of anaphylaxis. 5 patients with food dependent exercise induced anaphylaxis (FDEIA) were reported by Morita et al. (2003) . 40 children, 39 with moderate to severe atopic dermatitis were reported by Palosuo et al. (2001) . Of these 29% had gastrointestinal symptoms, and 12% respiratory symptoms. 18 children with severe atopic dermatitis, eight had asthma and two had allergic rhinitis. Also 6 adults with severe, extensive, or intensively itching dermatitis and 1 adult with urticaria and a history of anaphylactic reactions (Varjonen et al. 2000 ). 18 patients with FDEIA were reported by Palosuo et al. (1999)  and Varjonen et al. (1997) . All had experienced reactions on exercise of generalized urticaria, 17 of the patients in association with collapse and 15 of the patients with an anaphylactic reaction. 7 children with urticaria, vomiting or anaphylaxis were reported by James et al. (1997) . 34 children with atopic dermatitis were reported by Varjonen et al. (1995) . 40 adults with 35 with atopic dermatitis, 1 rhinitis and 4 urticaria were reported by Varjonen et al. (1994) . Jones et al. (1995)  reported 26 children with confirmed wheat allergy, 82 with a positive SPT to wheat and 145 with a positive SPT to any grain. Overall 89% of patients had atopic dermatitis, and 38% had a combination of atopic dermatitis and asthma or allergic rhinitis or both. There was one history of anaphylaxis. 39 children of 1.4-15.3 years with atopic dermatitis were reported by Rasanen et al. (1994) . Prick-Prick with beers and suspensions in saline (Herzinger et al. 2004) . Prick-Prick with baby food and SPT with flours and purified proteins (Zapatero et al. 2003 ). Purified gliadins (Morita et al. 2003 ). Purified omega-5 gliadin, pepsin digested omega-5 gliadin and the transglutaminase treated pepsin digest (Palosuo et al. 2003) . 1g flour in 5ml saline buffer (Simonato et al. 2001 ). Ethanol soluble gliadin (Varjonen et al 2000 ;Varjonen et al., 1995 ). Purified gliadins (Palosuo et al. 2001 ; Palosuo et al. 2001 ; Palosuo et al. 1999 ). Flour suspended 1 : 10 in 0.9% sodium chloride (Varjonen et al. 1994 ; Varjonen et al., 1995 ; Varjonen et al. 1997 ; Varjonen et al 2000 ; Palosuo et al. 2001 ; Palosuo et al. 2001 ; Palosuo et al. 1999 ; Järvinen et al 2003 ). Protocol: (controls, definition of positive etc)Histamine (10 mg/mL) was the positive control and saline the negative control, a 3 mm diameter wheal being taken as positive. 1 beer allergic patient (Herzinger et al. 2004) . 1 child of 9 months (Zapatero et al. 2003 ). 5 patients with food dependent exercise induced anaphylaxis (FDEIA) (Morita et al. 2003 ). 23 patients with exercise induced anaphylaxis (Palosuo et al. 2001 ) with 5 new and 18 included from Palosuo et al. (1999) ). 5 of the 18 were included in Varjonen et al. (1997) . 20 patients with exercise induced anaphylaxis and 3 with wheat allergy not related to exercise were reported by Palosuo et al. (2003) . 16/20 patients suffering from irritable bowel syndrome (Simonato et al. 2001 ). 40 children, mostly with atopic dermatitis (Palosuo et al. 2001 ). 18 wheat challenge positive patients with atopic dermatitis (Varjonen et al., 2000 ). 36 infants with atopic eczema (Majamaa et al., 1999 ). 112 patients with urticaria/angiooedema of unknown origin were tested (Varjonen et al. 1997 ). 7 children with food allergy and 1 adult with baker's asthma (James et al., 1997 ). 34 children with atopic dermatitis (Varjonen et al., 1995 ). 40 adults with 35 with atopic dermatitis, 1 rhinitis and 4 urticaria (Varjonen et al., 1994 ). 360 patients were tested but only 145 patients from 3 months to 30 years, median 4.5 years, had positive SPT to any grain and were included in study (Jones et al. 1995 ). 39 children of 1.4-15.3 years with atopic dermatitis (Rasanen et al. 1994 ). The patient developed a wheal >4 mm diameter in response to two brands of beer, 3 mm diameter to wheat malt shred and 2 mm diameter to barley malt shred or wheat flour. (Herzinger et al. 2004) . One 9 month old baby had a 7 X 5 mm wheal with baby food and 10 X 5 mm with wheat. Purified allergens gave a wheal of 10 X 5 mm with CM3 and 7 X 4 mm with CM16. The SPT gave a negative reaction with rye, barley, corn, rice and CM2 (Zapatero et al. 2003 ). In 18/20 patients with exercise induced anaphylaxis the transglutaminase treated digest, tTG, produced a markedly larger wheal (77% larger area over all 20 patients). Compared to the positive control, omega-5 gliadin was 1.8 fold larger in area, pepsin digest 1.6 fold and tTG 2.8 fold. 3 patients with wheat allergy not related to exercise reacted to omega-5 gliadin but not to digess or tTG (Palosuo et al. 2003) . 3/5 patients showed positive SPT reaction to beta-gliadin with a stronger reaction to fast omega-gliadin in these patients (Morita et al. 2003 ). 5/44 children gave positive SPT with wheat, and all 5 were positive on open challenge (Järvinen et al 2003 ). 9/16 patients gave positive SPT to wheat (Simonato et al. 2001 ). 23/40 had a positive SPT to wheat (Palosuo et al. 2001 ). 23/23 gave positive SPT with wheat and 19/19 gave positive SPT with omega-5 gliadin (Palosuo et al. 2001 ; Palosuo et al. 1999 ). 18 wheat challenge positive patients with atopic dermatitis were assessed. 11 had positive SPTs with gliadin and all had elevated gluten RAST (Varjonen et al., 2000 ). 5/112 patients showed positive SPT with wheat (Varjonen et al. 1997 ). 7/8 patients had positive SPT (James et al., 1997 ). 82/145 had positive SPT to wheat (Jones et al. 1995 ). Rasanen et al. 1994  found that 9/9 children with immediate response to challenge and 9/14 with a delayed response were SPT positive. There was a good correlation between SPT, RAST and basophil histamine-release test results. However, 5/16 challenge negative patients had positive SPT. Weichel et al. (2006)  used recombinant proteins selected by phage display. Kitta et al. (2006)  extracted wheat flour with 8M urea, 2% (v/v) Triton X-100 and 0.001% Bromophenol blue. Precipitate was removed by centrifuging at 15,000 x g for 5 minutes at 4° C.
Herzinger et al. (2004)  used commercial extracts. Zapatero et al. (2003)  used saline wheat flour extract. Lehto et al. (2003)  used crude gliadin and purified omega-5 gliadin. Battais et al. (2003)  used sequentially purified fractions. Palosuo et al. (1999)  and Palosuo et al. (2001)  used purified and crude gliadins and commercial extracts. James et al. (1997)  extracted flour with phosphate-buffered saline, 1:20 (wt/vol). Varjonen et al. (2000) , Varjonen et al. (1995)  and Varjonen et al. (1994)  used commercial wheat and gluten extracts for RAST. Rasanen et al. (1994)  used commercial extracts. RAST or CAP-RAST (Pharmacia) except CAP-FEIA (Simonato et al. 2001 ) and ELISA (Lehto et al 2003 ). Morita et al. (2003)  used dot blotting on nitrocellulose sheets with sera and visualized the IgE antibodies by adding peroxidase-labelled anti-human IgE antibodies, which were measured using chemiluminesence. Weichel et al. (2006)  used affinity selection of phage displayed wheat and maize clones against a serum pool and immunoblotting. Number of Patients:Weichel et al. (2006)  used sera from 6 wheat allergic individuals (and also 9 maize allergic). Kitta et al. (2006)  used sera from a single individual who was RAST positive to wheat. Lehto et al. (2003)  used sera from 27 patients with wheat dependent exercise induced anaphylaxis (WDEIA) and 21 controls. Palosuo et al. (2003)  used pooled sera from 10 patients with exercise induced anaphylaxis. Battais et al. (2003)  used sera from 28 patients with food allergy to wheat. Morita et al. (2003)  used sera from 5 patients with WDEIA and 1 control. Simonato et al. (2001)  used sera from 20 patients suffering from irritable bowel syndrome. Palosuo et al. (2001)  used sera from 40 children. 39 had atopic dermatitis and several had gastrointestinal symptoms and/or respiratory symptoms. Varjonen et al. (2000)  used sera from 18 children with atopic determatitis and 7 adults, 6 with AD and one urticaria and anaphylaxis. Palosuo et al. (1999)  used sera from 18 patients with WDEIA. James et al. (1997)  used sera from 7 children with food allergy and 1 adult with baker's asthma. Varjonen et al. (1995)  used sera from 34 children with atopic determatitis. Varjonen et al. (1994)  used sera from 40 adults, 35 with atopic determatis, 1 with rhinitis and 4 with urticaria. Rasanen et al. (1994)  used sera from 39 children of 1.4-15.3 years with atopic dermatitis. Specific IgE to wheat flour was 4.96 kU/l, barley flour 1.21 kU/l and barley malt 1.47 kU/l. Negative for hops or yeast (Herzinger et al. 2004) . Specific IgE was 17.9 kU/l for wheat flour, 0.71 kU/l for barley and 1.88 kU/l for rye (Zapatero et al. 2003 ). All 27 patients with WDEIA had IgE antibodies to purified omega-5 gliadin (mean ELISA value 1.0) and crude gliadin extract (mean ELISA value 0.77), whereas the 21 subjects without wheat allergy remained negative in ELISA. IgA to the allergens was also elevated in patients (Lehto et al 2003 ). Alpha-, beta-, gamma- and omega-gliadins, LMW glutenin subunits and some water/salt-soluble appeared as major IgE binding allergens (by RAST), whereas HMW glutenins were only minor allergens. 9 sera did not bind any the prolamins. Similar antigenic profile for prolamins was observed with IgG antibodies (Battais et al. 2003 ). Simonato et al. (2001)  found 11/20 patients were CAP positive to wheat and only one to gluten. Kusaba-Nakayama et al (2000)  found IgE in sera from 11 patients gave RAST values of 3 or 4 against wheat. 8/11 sera bound salt-soluble proteins of wheat and purified alpha-amylase inhibitor proteins using ELISA. Varjonen et al. (2000)  found positive RAST to wheat and gluten in all the challenge positive children. 3 challenge negative children were RAST positive for wheat but not for gluten. All 7 adults were RAST positive for wheat and gluten. Palosuo et al. (1999)  found all 18 were positive by RAST (0.4-30.0 KU/L, mean 9.0). All 18 sera bound to omega-5 gliadin (Tri a 19) by ELISA and 13 sera bound to alpha-gliadin. Varjonen et al. (1997)  found that sera from all 5 patients gave positive RAST to wheat, gluten, rye and oats. 3/5 were also positive with barley. 5/6 sera from children was positive by RAST for wheat IgE (James et al., 1997 ). Varjonen et al. (1995)  found that sera from 32/34 patients had 2.9-68.0 kU/L by RAST for wheat IgE and were also positive to gluten. 2 had 0.3 and 0.4 kU/L to wheat and were negative for gluten. Rasanen et al. 1994  found that 8/9 children with immediate response to challenge and 9/14 with a delayed response were RAST positive. 8/8 with immediate response to challenge and 8/14 with a delayed response also gave a positive basophil histamine-release test . 6/16 of the challenge negative patients had weakly positive RASTs with 2 of these also positive basophil histamine-release tests. Weichel et al. (2006)  used SDS-PAGE (NuPAGE™, 12% Bis-Tris, Invitrogen) with 10 μl samples of recombinant proteins in 8 M urea. Kitta et al. (2006)  separated allergens by 2-D ellectrophoresis. For the first dimension 200 μg of protein was loaded onto Immobiline DryStrip (pH 3-10, 11 cm, Amersham Biosciences) and after rehydrating for 16 h, IEF was run to a steady state using IPGphor (Amersham Biosciences) apparatus. Kitta et al. (2006)  compared second dimension separations using conventional 12.5% acrylamide Tris-glycine SDS-PAGE and with 5.2 (v/v) acetic acid, 2.5M urea with 20% acrylamide gels (AU-PAGE), aimed at separating low molecular mass samples. Before the second dimension, strips were equilibrated for SDS-PAGE with urea, SDS and DTT followed by urea, SDS and iodoacetamide or 1M HCl, 5% (v/v) beta-mercaptoethanol and 9M urea for AU-PAGE. Palosuo et al. (2003)  and Palosuo et al. (2001)  separated samples by SDS-PAGE on 11%, 12.8% or 14% acrylamide gels. Samples were reduced and heated for 2 minutes at 96° C.
Battais et al. (2003)  separated proteins from albumin/globulin and glutenin fractions by SDS-PAGE in reducing conditions on 15% and 10% acrylamide gels, respectively, in reducing conditions. Proteins from gliadin extract were separated by acid-PAGE. Simonato et al. (2001)  separated proteins from both salt soluble and prolamin fractions by SDS-PAGE in reducing conditions on 15% acrylamide gels. Samples were heated with beta-mercaptoethanol for 5 min in a boiling water bath. James et al. (1997)  used 1D SDS-PAGE with a 3% stacking gel and 12.5% separating gel without reduction. Jones et al. (1995)  used 1D SDS-PAGE with a 3% stacking gel and 13.5% separating with dithiothreitol. Weichel et al. (2006)  electroblotted proteins onto a Hybond™-P PVDF membrane (Amersham Pharmacia Biotech, Uppsala, Sweden). The membranes were blocked with 5% (w/v) nonfat milk powder, 0.1% (v/v) Tween-20 in Tris buffered saline and incubated with the pool of sera diluted 1:10 in blocking buffer. IgE binding was detected with TN-142 mouse anti-human IgE mAB and revealed with horseradish peroxidase labelled goat anti-mouse IgG (NXA931, 1 :5000 in blocking buffer, Amersham Pharmacia Biotech) followed by ECL Plus™ (Amersham Pharmacia Biotech). Kitta et al. (2006)  transfered proteins from the AU-PAGE gel after equilibrating with cold 0.7% (v/v) acetic acid onto Immun-Blot PVDF (polyvinylidene difluoride) 0.2 μm membranes (Bio-Rad) by semi-dry electroblotting. The membranes were blocked with 5% (w/v) nonfat milk powder in TBST (Tween-20, 20 mM Tris/HCl and 137 mM NaCl, pH 7.6). The membranes were incubated with sera (1:200 diluted with Can Get Signal solution 1, Toyobo, Osaka) for 1 h at room temperature. After washing 4 times with TBST, the membrane was incubated with horseradish peroxidase labelled goat anti-human IgE (KPL, Gaithersburg, USA) in Can Get Signal solution 2 (Toyobo, Osaka) followed by washing with TBST. Bound IgE was revealed with ECL Plus Western Blotting Detection Reagents (Amersham Biosciences). Palosuo et al. (2003)  and Palosuo et al. (2001)  transfered proteins onto polyvinylidene difluoride membranes (Immobilion-P, Millipore, Bedford, Mass) by electroblotting. The membranes were blocked with 5% (w/v) nonfat milk powder in tris buffered saline (pH 7.4) and incubated overnight with pooled sera (diluted 1:10 in blocking solution). The membranes were incubated in blocking solution for 30 minutes with biotinylated goat anti-IgE (or donkey anti-IgG) and then for 30 minutes with alkaline phosphatase conjugated to streptavidin. IgE binding was revealed with alkaline phosphatase color development buffer (Bio-Rad). Simonato et al. (2001)  transferred proteins onto nitrocellulose membranes by semidry electroblotting. Membranes were blocked with solution containing 0.05% Tween 20 and 5% skim milk powder for 4h, and then incubated overnight with single patient sera diluted with blocking solution. After washing, blots were incubated for 1 h with an antihuman IgE peroxidase-conjugate antibody (Sigma) diluted 1:6000. After washing, peroxidase activity was visualized by chemiluminescence. Battais et al. (2003) , James et al. (1997)  and Jones et al. (1995)  also used nitrocellulose membranes and washed with Tween containing solutions (but without milk powder). Weichel et al. (2006)  reported that recombinant sequences of the alpha-amylase inhibitors CM17 and 0.19, gamma-gliadin, alpha/beta-gliadin, thiorodoxin (Tri a 25), serine carboxypeptidase II, and four less well characterised proteins (described as putative high mobility protein, putative leucine rich protein, unknown protein AJ890018 and the Phl p 1 homologue EXPB11) bound to IgE from the serum pool (a beta-purothionin and wheat profilin were also noted as binding IgE but not shown in the immunoblot). Kitta et al. (2006)  used MALDI Tof mass spectroscopy to identify 3 low molecular mass IgE binding proteins as the alpha-amylase inhibitor family proteins CM 16 and CM17 and lipid transfer protein 1. Zapatero et al. (2003)  found a IgE binding polypeptide at 15 kDa using sera from their patient. Battais et al. (2003)  found that 67% of the 27 sera tested were positive against the albumin/globulin fraction. Palosuo et al. (2003)  found that omega-5 gliadin, pepsin digested omega-5 gliadin and the transglutaminase treated pepsin digest bound IgE strongly by immunoblotting and ELISA. Omega-5 gliadin digested successively by pepsin and trypsin bound IgE less strongly. All 5 patients had IgE antibodies to fast omega-gliadin when tested by dot-blotting (Morita et al. 2003 ). Simonato et al. (2001)  found that IgE binding of wheat salt soluble proteins varied from patient to patient. However, a band of about 16 kDa was recognized by sera from 12/20 (60%) patients. The salt-insoluble wheat flour proteins were also bound by all but one of the patient's sera. Most sera recognized bands belonging to the HMW, S-rich and S-poor prolamins. In particular LMW glutenin subunit components with Mrs around 42 kDa gave a strong reaction in 13/20 (65%) patients. Varjonen et al. (2000)  found heavily stained bands below 14 kDa in sera from all children either challenge or SPT positive to gliadin as well as in two adults who were SPT positive to gliadin. Immunoblots were negative in seven out of eight patients with negative gliadin SPT. Heavily stained bands in the main gliadin area between 30 and 46 kDa were also notable. James et al. (1997)  identified a 15 kd wheat protein, shown by N-terminal sequencing to be an alpha-amylase inhibitor, that bound IgE from the sera of all five children tested and not to control sera. Jones et al. (1995)  found specific IgE binding to a 47 kd and/or 20 kd wheat fraction in eight of nine study patients with wheat allergy. Varjonen et al. (1995)  found anti-wheat IgE in 29/34 sera with IgE binding polypeptides at 26 and 69 kDa identified in 26 patients, then 38, 24 and 79 kDa (62%, 48% and 41% of patients), then 8, 11, 22 and 82 kDa in 27% of patients and 30, 40 and 58 kDa in 24% of patients. Varjonen et al. (1994)  found a total of 36 IgE stained bands with the 26 kDa band seen in 15 patient's sera and 7, 8, 20, 24, 25, 28, 30, 32, 38, 40, 44, 46, 50, 69, 79, 82 and 84 kDa bands binding IgE from >10% of sera. Scibilia et al. (2006)  used raw wheat test meals of wheat flour (50% durum and 50% tender), water, cocoa, sugar, and lemon aroma syrup and placebo meals used potato starch instead of wheat. The wheat flour used was cooked for cooked test meal and the placebo meal contained potato starch, water, cocoa, partially cooked minced rice, and lemon aroma syrup. Doses were administered at 20-minute intervals starting with 100 mg raw wheat flour, then 500 mg, 1 g, 1.5 g, 3 g, 6 g, 12 g until symptoms were reported/observed or until the entire 25 g test meal was eaten. A DBPCFC with cooked wheat followed if the patient reacted to raw flour. If the raw flour challenge was negative, an open challenge was given with 25 g cooked wheat pasta. Majamaa et al. (1999) used 10g of wheat flour in 100 ml water mixed with 5 g of the amino acid derived Neocate (SHS Int. Ltd, Liverpool, UK) as the test and used Neocate in water as the placebo. Cooked wheat porridge was used in other studies with 1g followed by 5g and 10g. (Varjonen et al. 2000 ; Palosuo et al. 2001 ). 10% (w/v) wheat cooked in water, 1 to 100ml. with buckwheat in single blind tests (Rasanen et al. 1994). DBPCFC followed by open challenge if negative (Scibilia et al. 2006) . Open (Zapatero et al. 2003 ). 11 DBPCFC and 27 open (Palosuo et al. 2001 ). Open (Varjonen et al. (2000) ). 24 DBPCFC and 15 open (Majamaa et al. 1999 ). DBPCFC (James et al. (1997) . Open (Varjonen et al. 1995) . 27 patients (Scibilia et al. 2006) . 44 children (Järvinen et al 2003 ). 38 children (Palosuo et al. 2001 ). 39 children below 2 years old (Majamaa et al. 1999 ). 6 children (James et al. 1997 ). 126 children were challenged with wheat from 145 patients, 3 months to 30 years, median 4.5 years who had a positive SPT to a grain (Jones et al. 1995 ). 34 children with 4 under 1 year old, 20 1-5 years old and 10 5-11 years old (Varjonen et al. 1995 . 39 children of 1.4-15.3 years (Rasanen et al. 1994 ). Scibilia et al. (2006)  reported the minimum dose provoking an objective reaction was 0.1g of wheat flour and that 2 patients reacted at that dose and a third at 0.15 g. 5 patients reacted to 1.6g or less. Majamaa et al. (1999)  found the mean (SD) dose and time until reaction were 30.6 (27.5) ml and 0.9 (0.6) h, respectively for immediate reactions and 161 (71) ml and 21 (9.4) h, respectively for delayed reactions. Scibilia et al. (2006)  reported that 13/27 patients reacted in DBPCFC to raw wheat, responded to the placebo and 9 were negative on challenge (6/9 had resumed eating wheat while 3 reported nonspecific symptoms such as bloating, drowsiness, and light-headedness). 2 of the positive challenges required exercise. 11/13 were challenged with cooked wheat and 10/11 reacted. The symptoms (frequency) included asthma (2), angioedema (3), cough (2), erythema (6), abdominal colic (4), oral allergy syndrome (3), pruritus (2), rhinitis (1), urticaria (5) and nausea and vomiting (2). These symptoms all occured during or shortly after challenge and 62% of the patients who reacted had symptoms affecting 2 or more organs. Both the DBPCFC and clinical history showed that one patient was able to tolerate cooked wheat products but not raw flour. A single patient reported a migraine headache 12-15 hours after challenge with both raw and cooked wheat. A further challenge after 6 months reproduced this symptom. Symptoms for 6 of these patients are also reported in Weichel et al. (2006) . 40 min after eating four spoonfuls of baby food, the patient presented trunk urticaria, eyelid angioedema, cough, wheezing and vomiting (Zapatero et al. 2003 ). Järvinen et al (2003)  found 30/44 children showed symptoms on open challenge with wheat: 8 immediate with 6 urticaria and 2 pruritic rash and 22 delayed with 15 eczematous rash, 1 diarrhoea and 6 rash and diarrhoea. Reactions that occurred within an hour from the last dose were defined as immediate. Palosuo et al. (2001)  found that 17/38 children (48%) reacted with immediate symptoms including urticaria (8 cases), erythema, pruritus, rhinorrhea, sneezing, dyspnea, abdominal pain, vomiting and one anaphylaxis. 8/38 children (20%) reacted with delayed hypersensitivity symptoms (atopic dermatitis and/or diarrhea). 2 were not challenged because of recent anaphylaxis. Varjonen et al. (2000)  found four children developed urticaria (10-30min), one urticaria and wheezing (1h), four erythema and pruritus (30 min, 2h, 3h and 48 h), and four eczema (24-72h). Five were negative in oral challenge. 4 adults showed improvement on an elimination diet. Majamaa et al. (1999)  found 22/39 children gave a positive challenge with 16 DBPCFC and 6 open. 5 (23%) involved immediate type urticaria. 17 (77%) patients exhibited delayed onset reactions of eczematous or gastrointestinal type with 6 atopic eczema, 1 diarrhea, and 10 patients both atopic eczema and gastrointestinal symptoms. Reactions that occurred within 2 hours from the last dose were defined as immediate. James et al. (1997)  found 6/8 individuals had a positive oral challenge with wheat; two individuals with anaphylactic symptoms were not challenged. Jones et al. (1995)  reported that 26/126 children were positive on challenge with wheat, 1 via a history of anaphylaxis, with all immediate reactions. Varjonen et al. (1995)  tested initial skin contact followed by oral challenge. 6/34 gave wheals and were not subject to oral challenge. 5/28 children gave an immediate reaction with 2 urticaria, 2 itching of mouth and throat with localized urticaria and 1 generalized urticaria and rhinitis. 10/28 children developed delayed reactions with 8 erythema and pruritus causing intense scratching, 1 morbilliform rash and 1 abdominal pain followed by pruritus of the skin. Reactions that occurred within 2 hours from the last dose were defined as immediate. Rasanen et al. (1994)  found that 18 children responded to wheat, 3 to rye, 1 to barley and 1 to oats. 8 gave immediate symptoms of urticaria or erythmia, 14 gave delayed symptoms with 13 eczema, 5 diarrheoa and 4 abdominal pain and 1 child gave both immediate and delayed symptoms. Reactions that occurred within 2 hours from the last dose were defined as immediate. 16 children were challenge negative. Simonato et al. 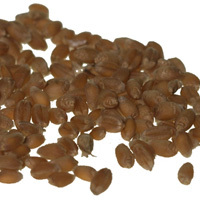 (2002)  show that kamut is effectively allergenically identical to wheat. Pastorello et al. (2001)  report a case of occupational sensitization to spelt (Triticum spelta) which was associated with symptoms on ingestion of several foods. IgE binding to a 9 kDa protein (and weaker binding to 15 and 60 kDa proteins) was identified and the nsLTP identified as the allergen. Binding could be completely inhibited by peach. Even after changing occupation, allergy to peach and apricot persisted when other foods could be eaten. Battais et al. (2004)  also reported 17 wheat allergic patients with IgE reactive with wheat LTP1. Sera from some of these also bound wheat LTP2 (5/15), barley LTP1 (6/15) and maize LTP (11/15). Barley, wheat and rye are closely related cereals, all being members of the Triticeae, and have seed storage prolamins as the major seed protein constituent. Oats are more distantly related and contain a lower proportion of storage prolamins which are structurally distinct from those of the Triticeae. Palosuo et al. (2001)  showed that gamma-70 and gamma-35 secalins in rye and gamma-3 hordein in barley are IgE cross-reactive with omega-5 gliadin, a major allergen in wheat-dependent, exercise-induced anaphylaxis. These are homologous proteins. Food dependent exercise induced anaphylaxis (FDEIA) is a symptom of IgE mediated type I hypersensity. Wheat and related cereals have been frequently associated with FDEIA. It is not clear how FDEIA differs from other IgE mediated symptoms. Often the food can be eaten without any symptoms if not followed by exercise but a patient who had previously suffered FDEIA, suffered anaphylaxis after eating a large quantity of the allergenic food without exercise (Pauls & Cross, 1998 ). Diagnosis is difficult and it has been suggested that exercise may not be the only factor as aspirin enhances the reaction (Aihara et al. 2002 ). There is a case where the quantity of wheat eaten was clearly related to the occurrence of FDEIA (Hanakawa et al. 1998 ). Palosuo et al. (2003)  suggest that the stress of exercise activates transglutaminase and that patients with FDEIA to wheat respond more strongly to the aggregates formed from partially digested omega-5 gliadin by transglutaminase treatment. Atopic dermatitis (AD) has been associated with cereals such as wheat and many of the studies of wheat allergy have used these patients. However, even the involvement of food in atopic dermatitis has provoked controversy on the question of whether food allergy causes AD, AD increases the risk of food allergy or whether both have a common predisposition. Recently a consensus seems to be developing that IgE mediated reactions are important in childhood AD and it seems clear that removal of identified allergenic foods from the diet leads to improvement of AD (Burks 2003 ; Sampson 2003 ). Ito et al. (2004)  report that the prevalence of immediate reaction to food challenge in the AD patients was 85.7% in age 0 years, 75.6% in age 1, 65.4% in age 2, and declined to 13.9% in age 7 years old or more. Laske and Niggemann (2004)  report a significant but imperfect correlation between the severity of AD and serum IgE levels. Similarly Hill et al. (2000)  reported a correlation between SPT results and AD. The nature of the reaction on food challenge is also unclear as only the immediate reactions (up to 2-3 hours after challenge) fall into the normal pattern of IgE mediated type I hypersensity. However, as shown above, several studies report more delayed than immediate reactions to cereals in patients with AD. Some delayed reactions are associated with positive SPT results and with the detection of specific IgEs by CAP or RAST (Järvinen et al. 2003 ; Majamaa et al. 1999; Rasanen et al. 1994 ). Rasanen et al. 1994 ) suggested that the challenge protocol could be important with slowly increasing doses being associated with delayed responses. However, Palosuo et al. (2001)  have suggested that different allergens may be associated with immediate and delayed responses. It has also been suggested that immediate and delayed reactions to food reflect related deviations of the immune system (Latcham et al. 2003 ; Sabra et al. 2003 ). Irritable bowel syndrome has also been controversially linked to food allergy. Simonato et al. (2001)  have presented evidence that the extent of IgE involvement may be greater than previously believed. Allergic reactions to wheat isolates have been reported. In one case reported by Leduc et al. (2003) , the patient could tolerate 30 g of raw wheat flour despite giving a 6 mm wheal on SPT with purifed omega-gliadin and a 2.5 mm wheal with purified gamma-gliadin. With the modified isolate, the patient gave a 19 mm wheal on SPT and showed nasal itching, sneezing and pharyngeal discomfort followed by cough and pharyngeal itching after an open challenge with 2 g. It was concluded that the processing (deamidation) had generated a neo-allergen. Cases of reaction to hydrolysed wheat proteins in cosmetics have also been reported (Laurière et al 2006 ). Baker's asthma and coeliac (celiac) disease are outside the scope of this database but are important hypersensities to wheat. Baker's asthma is an IgE mediated type I hypersensity to wheat as an aeroallergen. It appears to involve a larger number of allergens than have been identified as food allergens (Armentia et al. 2002 ; Sander et al 2001 ; Amano et al. 1998 ) possibly because several wheat allergens are inactivated by cooking. At least some patients with baker's asthma can eat bread without problems. However, there is evidence that patients with baker's asthma can develop food allergies to ingested cereals. Coeliac disease is the most common wheat hypersensitivity. It is a T-cell mediated reaction to cereal gliadins (Shan et al. 2002 ) and is distinct from IgE mediated type I hypersensity to wheat in both clinical symptoms and in mechanism (Green and Jabri, 2003 ). Dermatitis herpetiformis involves IgA antibodies but may be related to coeliac disease (Karpati 2004 ). Food protein-induced enterocolitis syndrome is another cell mediated hypersensitivity found with cereals (Nowak-Wegrzyn et al. 2003 ). Sabra A, Bellanti JA, Rais JM, Castro HJ, de Inocencio JM, Sabra S.
IgE and non-IgE food allergy. Hill DJ, Sporik R, Thorburn J, Hosking CS. The association of atopic dermatitis in infancy with immunoglobulin E food sensitization. Simonato B, Pasini G, Giannattasio M, Peruffo AD, De Lazzari F, Curioni A. Food allergy to wheat products: the effect of bread baking and in vitro digestion on wheat allergenic proteins. A study with bread dough, crumb, and crust. Simonato B, De Lazzari F, Pasini G, Polato F, Giannattasio M, Gemignani C, Peruffo AD, Santucci B, Plebani M, Curioni A.
IgE binding to soluble and insoluble wheat flour proteins in atopic and non-atopic patients suffering from gastrointestinal symptoms after wheat ingestion. Amano M, Ogawa H, Kojima K, Kamidaira T, Suetsugu S, Yoshihama M, Satoh T, Samejima T, Matsumoto I. Identification of the major allergens in wheat flour responsible for baker's asthma. Sander I, Flagge A, Merget R, Halder TM, Meyer HE, Baur X. Identification of wheat flour allergens by means of 2-dimensional immunoblotting. Armentia A, Rodriguez R, Callejo A, Martin-Esteban M, Martin-Santos JM, Salcedo G, Pascual C, Sanchez-Monge R, Pardo M.
Allergy after ingestion or inhalation of cereals involves similar allergens in different ages. Morita E, Matsuo H, Mihara S, Morimoto K, Savage AW, Tatham AS. Fast omega-gliadin is a major allergen in wheat-dependent exercise-induced anaphylaxis. Battais F, Pineau F, Popineau Y, Aparicio C, Kanny G, Guerin L, Moneret-Vautrin DA, Denery-Papini S.
Food allergy to wheat: identification of immunogloglin E and immunoglobulinG-binding proteins with sequential extracts and purified proteins from wheat flour. Palosuo K, Varjonen E, Kekki OM, Klemola T, Kalkkinen N, Alenius H, Reunala T.
Wheat omega-5 gliadin is a major allergen in children with immediate allergy to ingested wheat. Simonato B, Pasini G, Giannattasio M, Curioni A.
Allergenic potential of Kamut wheat. Lehto M, Palosuo K, Varjonen E, Majuri ML, Andersson U, Reunala T, Alenius H.
Morita E, Yamamura Y, Mihara S, Kameyoshi Y, Yamamoto S.
Food-dependent exercise-induced anaphylaxis: a report of two cases and determination of wheat-gamma-gliadin as the presumptive allergen. Wheat alpha-amylase inhibitor: A second route of allergic sensitisation. CM3, one of the wheat alpha-amylase inhibitor subunits, and binding of IgE in sera from Japanese with atopic dermatitis related to wheat. Majamaa H, Moisio P, Holm K, Turjanmaa K.
Antigliadin IgE-indicator of wheat allergy in atopic dermatitis. Latcham F, Merino F, Lang A, Garvey J, Thomson MA, Walker-Smith JA, Davies SE, Phillips AD, Murch SH. A consistent pattern of minor immunodeficiency and subtle enteropathy in children with multiple food allergy. Does the severity of atopic dermatitis correlate with serum IgE levels? Ito K, Morishita M, Ito A, Sakamoto T, Torii S.
Aihara M, Miyazawa M, Osuna H, Tsubaki K, Ikebe T, Aihara Y, Ikezawa Z.
Food-dependent exercise-induced anaphylaxis: influence of concurrent aspirin administration on skin testing and provocation. Matsuo H, Morita E, Tatham AS, Morimoto K, Horikawa T, Osuna H, Kaneko S, Kohno K, Dekio S.
Skin manifestations of food allergy. Dermatitis herpetiformis: close to unravelling a disease. Zapatero L, Martinez MI, Alonso E, Salcedo G, Sanchez-Monge R, Barber D, Lombardero M.
Oral wheat flour anaphylaxis related to wheat alpha-amylase inhibitor subunits CM3 and CM16. Hanakawa Y, Tohyama M, Shirakata Y, Murakami S, Hashimoto K.
Food-dependent exercise-induced anaphylaxis: a case related to the amount of food allergen ingested. Pastorello EA, Farioli L, Robino AM, Trambaioli C, Conti A, Pravettoni V.
A lipid transfer protein involved in occupational sensitization to spelt. Palosuo K, Varjonen E, Nurkkala J, Kalkkinen N, Harvima R, Reunala T, Alenius H.
Transglutaminase-mediated cross-linking of a peptic fraction of omega-5 gliadin enhances IgE reactivity in wheat-dependent, exercise-induced anaphylaxis. Nowak-Wegrzyn A, Sampson HA, Wood RA, Sicherer SH. Food protein-induced enterocolitis syndrome caused by solid food proteins. Battais F., Douliez J.P., Marion D., Popineau Y., Kanny G., Moneret-Vautrin D.A. and Denery-Papini S.
Involvement of lipid Transfer Proteins in food allergy to wheat. Herzinger T, Kick G, Ludolph-Hauser D, Przybilla B.
Kitta K, Ohnishi-Kameyama M, Moriyama T, Ogawa T, Kawamoto S.
Detection of low-molecular weight allergens resolved on two-dimensional electrophoresis with acid-urea polyacrylamide gel. Weichel M, Vergoossen NJ, Bonomi S, Scibilia J, Ortolani C, Ballmer-Weber BK, Pastorello EA, Crameri R.
Scibilia J, Pastorello EA, Zisa G, Ottolenghi A, Bindslev-Jensen C, Pravettoni V, Scovena E, Robino A, Ortolani C.
Leduc V, Moneret-Vautrin DA, Guerin L, Morisset M, Kanny G.
Anaphylaxis to wheat isolates: immunochemical study of a case proved by means of double-blind, placebo-controlled food challenge. Process, chemical, enzymatic:The gliadins are thermally stable, retaining allergenic activity after baking into bread or cooking in pasta. The stability of cereal allergens from wheat, rye, barley and oat was studied by Varjonen et al. (1996)  who found that no processing condition entirely abolished IgE binding. Allergen purification:Wheat grains were ground and extracted with 50% acetonitrile and 0.1% trifluoroacetic acid. The acetonitrile-soluble wheat proteins were purified by reversed-phase chromatography on a 3-mL column (Resource RPC; Pharmacia) with a linear gradient of acetonitrile (10% to 60% in 60 minutes) in 0.1% trifluoroacetic acid (Palosuo et al. 1999 ). Mesa-Del-Castillo et al. (2004)  identified by immunoblotting a 35 kDa water insoluble protein which bound to IgE from a wheat allergic patient. Digestion with pepsin reduced the mass to approximately 30 kDa without abolishing IgE binding. They suggested that this protein was Tri a 19. Battais et al. 2003  found by RAST that 67% of patients among the 27 analysed have IgE antibodies to gliadin fractions, 60% to alpha- and beta-gliadins, 55% to gamma- gliadins and 48% to total omega-gliadins. Palosuo et al. (1999)  found that IgE antibodies from pooled patient sera were bound to a 40-kDa allergen. The 40-kDa wheat protein's N-terminus gave 100% identity to alpha-gliadin (VRVPVPQLQPQNPSQQQPQEQV; 22 amino acids analyzed). There are very many wheat alpha-gliadin genes, which may not all be expressed, and only a few are listed above. The mature proteins are smaller than 40 kDa suggesting that gliadins run slowly on SDS-PAGE. Sandiford et al. (1997)  found IgE antibodies to alpha-gliadins in all 24 sera from patients with baker's asthma. Interestingly, there was IgE cross-reactivity between the water/salt soluble and insoluble allergens. Mesa-Del-Castillo M, Martinez-Cocera C, Caballero ML, Vazquez L, Moneo I.
IgE binding to pepsin-digested water soluble and insoluble wheat proteins. Sandiford CP, Tatham AS, Fido R, Welch JA, Jones MG, Tee RD, Shewry PR, Newman Taylor AJ. Identification of the major water/salt insoluble wheat proteins involved in cereal hypersensitivity. Process, chemical, enzymatic:Alpha-amylase inhibitors are normally stable because they possess 5 intramolecular disulphide bonds. Simonato et al. 2001  found that the 16 kDa allergens were destroyed on baking. Nature of main cross-reacting proteins:There are other members of the family in wheat, with >90% sequence identity, and other cereals which would be expected to show some cross-reactivity. Allergen properties & biological function:The 0.53 inhibitor is a dimer and is part of a family of inhibitors of trypsin and exogenous (i.e. non-plant) alpha-amylases (Carbonero & Garcia-Olmedo, 1999 ). More detailed studies have revealed a range of monomeric, dimeric and tetrameric forms, with the individual subunits being either inactive or inhibitory to trypsin (and sometimes other proteinases), alpha-amylases from insects (including pests) or both enzymes (i.e. the inhibitors are bifunctional). Allergen purification:Maeda et al. (1983)  purified the alpha-amylase inhibitor 0.53 by extraction from wheat flour with water, heat denaturation, ethanol fractionation and chromatography on Sepadex G-75 and CM-Sepharose CL-4B. James et al (1997)  identified a number of IgE-binding proteins from saline extracts of wheat with Mrs 15-47,000; one Mr ~15,000 polypeptide bound IgE from the sera of all five children tested and not to control sera. It was identified by N-terminal sequencing of 20 residues as the 0.53 inhibitor. Varjonen et al (2000)  identified proteins in the range 30-43 kDa and 14 kDa by immunoblotting. Varjonen et al (1995)  and Varjonen et al (1994)  also identified a 14 kDa protein recognised by IgE from a few sera. Simonato et al. (2001)  found that a band of about 16 kDa was recognized by IgE from sera from 12/20 (60%) patients. Similarly Battais et al. (2003)  found that albumin/globulin extract showed a major IgE binding band around 15 kDa. It is likely that the proteins in the 14-16 kDa region belong to the trypsin/alpha amylase inhibitors family of which the 0.53 inhibitor and CM3 have so far been identified as food allergens. Other members of the family are involved in baker's asthma. A multigene family of trypsin/alpha-amylase inhibitors from cereals. Maeda K, Hase T, Matsubara H.
Complete amino acid sequence of an alpha-amylase inhibitor in wheat kernel. Nature of main cross-reacting proteins:There are many members of the alpha-amylase family in cereals (Salcedo et al. 2004 ). For example, there are barley proteins with 83% sequence identity with CM3 suggesting that some cross-reactivity is likely. CM3 is one of the subunits of the tetrameric alpha-amylase inhibitors together with CM1/2 and CM16/17. These may inhibit insect or microbial amylases. CM3 is one of the most surface active proteins in wheat flour (Gilbert et al. 2003 ). Allergen purification:Purification of CM3 (Kusaba-Nakayama et al (2000) ; Gilbert et al. (2003) ) is by modification of the method of Sanchez-Monge et al. (1992) . The salt-soluble proteins are extracted and the tetrameric alpha-amylase inhibitors separated by gel filtration. CM3 was further purified by reverse-phase HPLC with subunits being eluted with a linear gradient of 15\Z35% propan-2-ol in 0.1% trifluoroacetic acid. Kusaba-Nakayama et al (2000) , by ELISA, and Zapatero et al. (2003) , by SPT, specifically identified CM3 (and CM16) as a food allergen. Varjonen et al (2000)  identified proteins around 14 kDa (and in the 30-43 kDa range) by immunoblotting . Varjonen et al (1995)  and Varjonen et al (1994)  also identified a 14 kDa band in a few sera. Simonato et al. (2001)  found that a band of about 16 kDa was recognized by sera from 12/20 (60%) patients. Similarly Battais et al. (2003)  found that albumin/globulin extract showed a major band around 15 kDa. It is likely that the proteins in the 14-16 kDa region belong to the trypsin/alpha amylase inhibitors family of which the 0.53 inhibitor and CM3 have so far been identified as food allergens. Other members of the family are involved in baker's asthma. Gilbert SM, Burnett GR, Mills EN, Belton PS, Shewry PR, Tatham AS. Identification of the wheat seed protein CM3 as a highly active emulsifier using a novel functional screen. Sanchez-Monge R, Gomez L, Barber D, Lopez-Otin C, Armentia A, Salcedo G.
Wheat and barley allergens associated with baker's asthma. Glycosylated subunits of the alpha-amylase-inhibitor family have enhanced IgE-binding capacity. Salcedo G, Sanchez-Monge R, Garcia-Casado G, Armentia A, Gomez L, Barber D.
The cereal alpha-amylase/trypsin inhibitor family associated with baker's asthma and food allergy. Process, chemical, enzymatic:Non-specific lipid transfer proteins are generally unusually stable towards denaturant, heat and proteases. Asero et al (2000)  report that they are very stable to pepsin catalysed proteolysis. However, this may depend on the four disuphide bridges remaining intact and nsLTP may be unstable after reduction. Wheat LTP1 has 74-75% sequence identity with barley nsLTP. This suggests some cross-reactivity between wheat and barley. Battais et al. (2004)  reported that some wheat allergic patients with IgE reactive with wheat LTP also bound barley LTP1. Pastorello et al. (2001)  reported that IgE binding to wheat LTP could be inhibited by peach. Wheat and peach nsLTPs have 46% sequence identity. Allergen properties & biological function:Plant nonspecific lipid-transfer proteins are thought to be involved in transport of fatty acids both intracellular and extracellularly and of cutin monomers to the cuticular layer of leaves and fruits. There is an expandable cavity between the four alpha-helices, maintained by the four disulphide bonds (Sy et al. 2003 ) which can bind one or two lipids (Charvolin et al. 1999 ). nsLTPs have also been reported to act as plant defense proteins against bacterial and fungal infections and form the PR14 family of pathogenesis related proteins (Buhot et al. 2001 ). Jones and Marinac (2000)  suggest that a function as a cysteine protease inhibitor may also be possible. Charvolin et al. (1999)  extracted wheat bran (1kg) with 5L of deionized water. After filtration through a Büchner funnel and centrifugation at 5000 x g for 20 min, the extract was loaded on a column (5 X 30 cm) packed with a cation-exchange resin (Streamline, Pharmacia). The fractions were eluted by applying a gradient from 0 to 0.7M NaCl in 20 mM Mes buffer, pH 5.6. ns-LTP1-enriched fractions were pooled, dialysed overnight against deionized water, and freeze-dried. The dry material was solubilized and loaded on a gel filtration column (3 X 100 cm) packed with Sephadex G50 and eluted in 20mM Mes buffer, pH 5.6. Finally, ns-LTP1 was purified from the enriched fractions by semipreparative C18 reversed-phase HPLC on a 5µm, 300-Å bonded silica column (25 X 1 cm) using a gradient of water/acetonitrile/0.05% trifluoroacetic acid (1% acetonitrile per min) at 50°C and freeze dried. The purity of the protein was checked by analytical HPLC and by mass spectrometry. Purification and partial characterization of a second cysteine proteinase inhibitor from ungerminated barley (Hordeum vulgare L.). Tassin-Moindrot S, Caille A, Douliez JP, Marion D, Vovelle F.
The wide binding properties of a wheat nonspecific lipid transfer protein. Solution structure of a complex with prostaglandin B2. Charvolin D, Douliez JP, Marion D, Cohen-Addad C, Pebay-Peyroula E.
The crystal structure of a wheat nonspecific lipid transfer protein (ns-LTP1) complexed with two molecules of phospholipid at 2.1 A resolution. Gincel E, Simorre JP, Caille A, Marion D, Ptak M, Vovelle F.
Three-dimensional structure in solution of a wheat lipid-transfer protein from multidimensional 1H-NMR data. A new folding for lipid carriers. Sy D, Le Gravier Y, Goodfellow J, Vovelle F.
Protein stability and plasticity of the hydrophobic cavity in wheat ns-LTP. Buhot N, Douliez JP, Jacquemard A, Marion D, Tran V, Maume BF, Milat ML, Ponchet M, Mikes V, Kader JC, Blein JP. A lipid transfer protein binds to a receptor involved in the control of plant defence responses. Matsuo et al (2004)  found that seven epitopes, QQIPQQQ, QQLPQQQ, QQFPQQQ, QQSPEQQ, QQSPQQQ, QQYPQQQ, and PYPP, were detected within the primary sequence of omega-5 gliadin. By using sera of 15 patients, 4 of the epitopes, QQIPQQQ, QQFPQQQ, QQSPEQQ, and QQSPQQQ, were found to be dominant epitopes. Mutational analysis of the QQIPQQQ and QQFPQQQ indicated that amino acids at positions Gln 1, Pro 4 , Gln 5, Gln 6, and Gln 7 were critical for IgE binding. The sequences were taken from ESTs since no full length sequence for omega-5 gliadin is currently available. Matsuo et al (2005)  extended this study with the complete sequence of omega-5 gliadin. They used sera from 3 patients and report that IgE antibodies of patient one reacted to QQIPQQQ, QQLPQQQ, QQFPQQQ, QQSPEQQ, QQSPQQQ, QQYPQQQ and QQPPQQ. The serum of patient two had specific IgE antibodies to QQIPQQQ, QQFPQQQ, QQSPEQQ, QQSPQQQ and YQQYPQQ. The serum of patient three had specific IgE antibodies to QQFPQQQ, QSPEQQQ, YQQYPQQ and QQFHQQQ. They note that the epitope sequences, QQPPQQ, YQQYPQQ, QSPEQQQ and QQFHQQQ, were additional to the previous study. Process, chemical, enzymatic:The prolamins are thermally stable, retaining allergenic activity after baking into bread or cooking in pasta. The stability cereal allergens from wheat, rye, barley and oat was studied by Varjonen et al. (1996)  who found that no processing condition entirely abolished IgE binding. Palosuo et al. (2003)  showed that pepsin digestion only slightly reduced IgE binding by ELISA but that further trypsin digestion reduced IgE binding. Nature of main cross-reacting proteins:Cross-reactive allergens are present in rye (gamma-70 and gamma-35 secalins) and barley (gamma-3 hordein). Allergen properties & biological function:The gliadins are seed storage proteins and are characteristically soluble in aqueous alcohols. They are members of the prolamin superfamily with a repetitive domain inserted in the classical prolamin superfamily cysteine skeleton (Mills et al. 2004 ). The omega-gliadins lack cysteines and thus -S-S- bonds. Palusuo et al. (1999)  and Lehto et al. 2003)  identified omega-gliadin as an allergen in all patients with wheat dependent exercise induced anaphylaxis (WDEIA). Similarly, Morita et al. 2003  found that all 5 WDEIA patients had IgE antibodies to fast omega-gliadin when tested by dot-blotting. Palosuo et al. (2003)  show that transglutaminase treatment of partial pepsin digests can produce aggregates that give a stronger reaction in skin tests on patients with WDEIA. IgE antibodies to omega-5 gliadin were found by ELISA in 16/19 children with atopic dermatitis who showed an immediate reaction to wheat but not detected in children with delayed or no symptoms in oral wheat challenge (Palusuo et al. 2001 ). The 32 residue N-terminal fragment SRLLSPRGKELHTPQEQFPQQQQFPQPQQFPQ was found by Palusuo et al. (1999) . This exactly matches http://www.expasy.org/uniprot/Q402I5 cloned by Matsuo et al (2005)  assuming the predicted removal of residues 1-19 as a signal sequence. Note that the omega-5 gliadins are distinct from omega-1,2 gliadins (Dupont et al. 2000 ; Seilmeier et al. 2001 ). Dupont et al. (2000)  reported masses by MALDI-ToF MS as 48.9, 50.1 and 51.3 kDa (1B1 fraction) and 49.085, 50.3 and 51.5 kDa (1B2 fraction) for the omega-5 gliadins. The calculated monoisotopic mass MH+ from Q40215 is 50927.98 in fair agreement. Both SDS-PAGE and gel filtration gave masses 57-65 kDa suggesting that these proteins run slowly on SDS-PAGE. Battais et al. (2003)  found by RAST that 67% of patients among the 27 analysed have IgE antibodies to gliadin fractions, 60% to alpha- and beta-gliadins, 55% to gamma- gliadins and 48% to total omega-gliadins. Seilmeier W, Valdez I, Mendez E, Wieser H.
Comparative investigations of gluten proteins from different wheat species II. Characterization of omega-gliadins. Dupont FM, Vensel WH, Chan R, Kasarda DD. Characterization of the 1B-Type omega-Gliadins from Triticum aestivum Cultivar Butte. Mills ENC, Jenkins JA, Alcocer MJC, Shewry PR. Matsuo H, Kohno K, Morita E.
Molecular cloning, recombinant expression and IgE-binding epitope of omega-5 gliadin, a major allergen in wheat-dependent exercise-induced anaphylaxis.